The bad news is that after finishing up three weeks on antibiotics (Clavamox), Darby produced urine yesterday that apparently was filled with white blood cells. I still have yet to talk to my vet (who was on vacation earlier in the week), but I did hear from Stu at CCI (who’s also traveling) that one of Darby’s littermates is having similar problems. In a panic, I called the veterinarian at CCI headquarters, who said if Darby is having no clinical symptoms, the urinalysis results might only mean that she has a mild case of vaginitis. She counseled waiting and seeing how she does. I’m really enjoying being in contact with Darby’s “birth humans.” (That never happened with our first three CCI pups.) 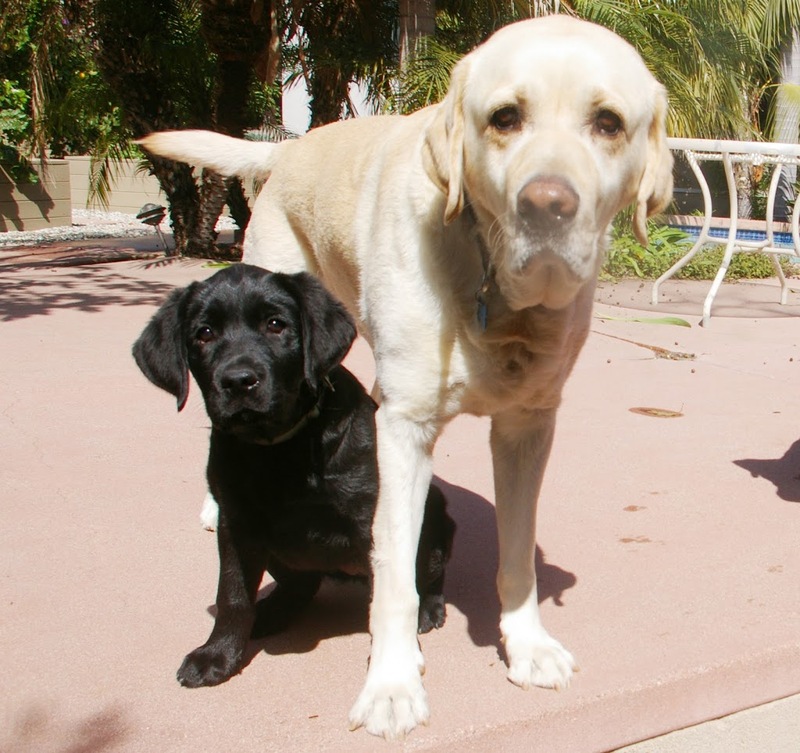 Her birth dad, Rick, has sent us links to great photos of the earliest days of her litter and directed me to a Yahoo group for people interested in sharing info about all the offspring of Paxton III, Darby’s sire. 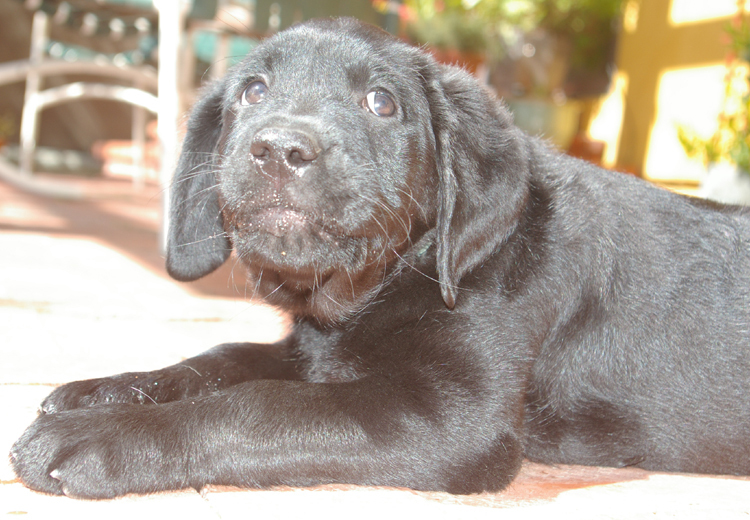 A full black labrador retriever, Paxton was the third out of a litter of five born on April 9, 2005, I learned. 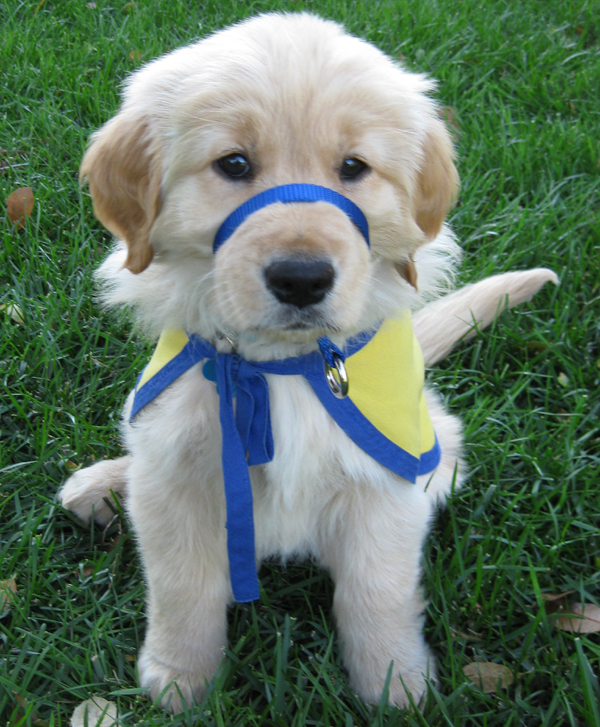 The Paxton group home page also says, “Out of the first 60 pups Paxton sired, 35 of them graduated : Four breeder girls, three Hearing Dogs, six Facility Dogs, 10 Service Dogs and 12 Skilled Companion Dogs. That is a 58.3% graduate success rate!” Sounds encouraging to me! We couldn’t tell who Tucker likes better. He seems to love all girls. Darby’s breeder/caretaker sent me a photo of her mother, Ina, when she was a pup, and I’ve been wanting to capture one of Darby, about the same age. 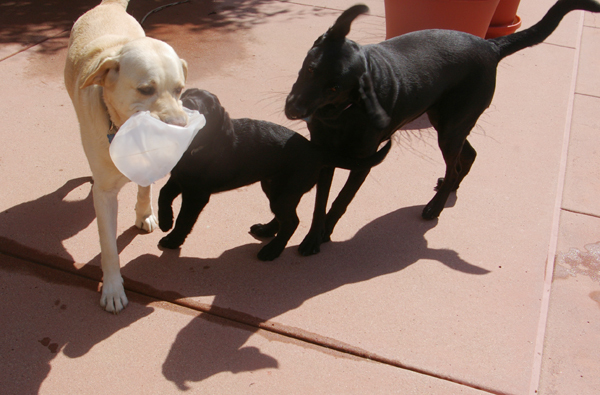 Note that it is HARDER to photograph black puppies than yellow ones. Also that Ina appears to have been better about sitting and staying with her Gentle Leader on. But it looks to me like Darby won’t be quite as furry. We had some setbacks in terms of peeing in the house, but I think we’re making slow but steady progress on Sleeping through the Night. Friday night she went from 10 p.m. to about 5 a.m. Saturday night, when she started playing with her toy bone at 3 a.m., Steve weakened and took her outside. But last night she went from 10 p.m. to 6 a.m. I could live with that indefinitely! She’s a dainty eater. Chews every piece of kibble deliberately and often leaves some in her bowl. But that isn’t stopping her from growing. This morning she weighed 20.5 pounds — four and a half pounds more than when I brought her home, less than two weeks ago. She’s still portable. But that won’t last for much longer. 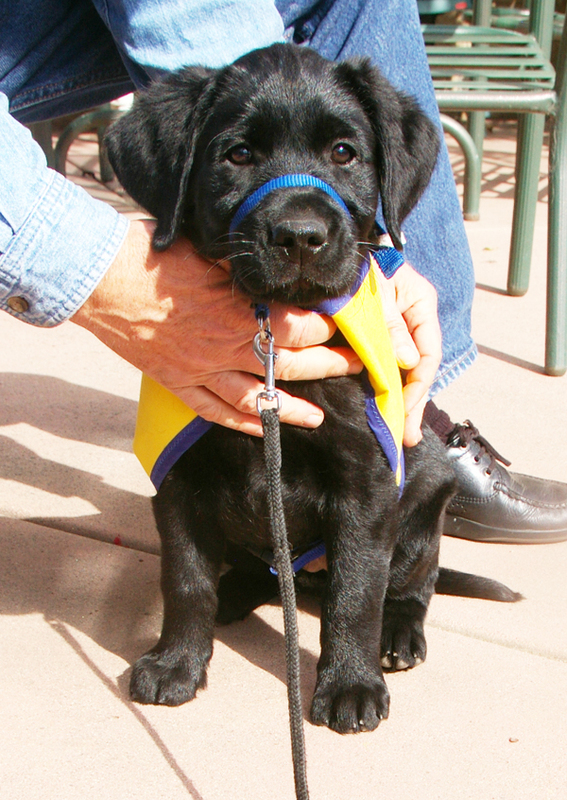 ﻿﻿﻿﻿﻿ We’ll mark another milestone tonight too: first puppy class! Yesterday was a landmark. Our first day with not one single accident in the house. Exactly one week after Darby’s arrival here. I’m not exactly sure who’s training whom. Steve and I have certainly tuned up our ability to read puppy body language — and to make multiple trips with Darby out to the backyard. (Puppies can’t have accidents if their bladders are empty.) And we’re not home free yet. This morning started out with a little deposit in the living room. But Darby clearly understands what we mean when we take her out and tell her to Hurry. As long as she’s got anything at all to excrete, she’ll urinate (at least). She loves to drink water (and even loves to splash it out of the water bowl.) 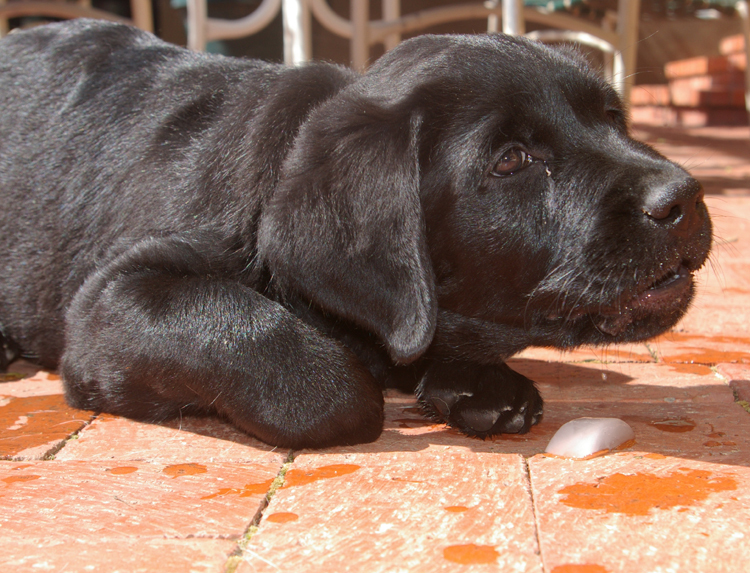 Yesterday, in the summery temperatures we’re enjoying, she also was introduced to ice, which she loved. Her mouth is dripping with the ice, held between her paws. 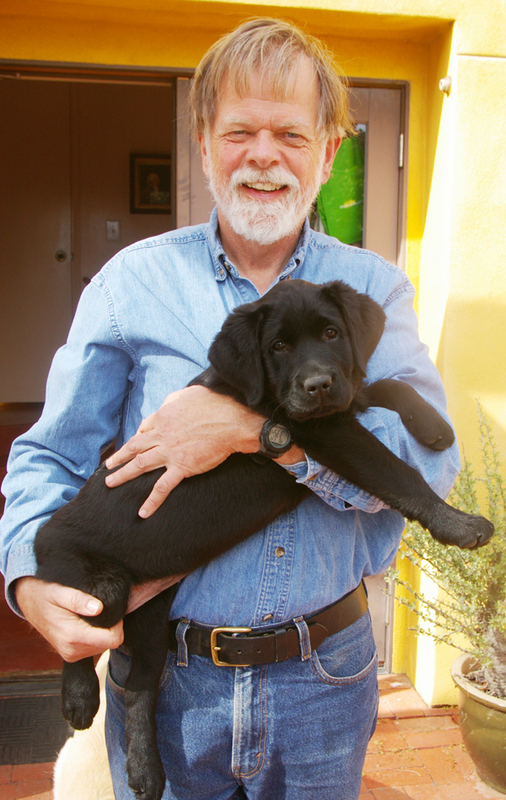 For the first time since we started raising CCI puppies, we’ve heard from the folks who took care of the litter from which Darby came — Irina Green and Rick Spicer, who live about 40 east of Sacramento. 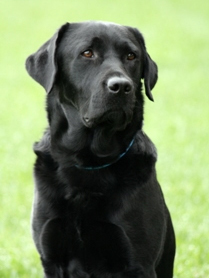 They raised Ina, Darby’s mother, and when CCI selected her to become a breeder, they asked to be her breeder-caretakers. Isn’t she gorgeous? Steve and I already appreciate that sweetness in her. Even Tucker seems to like her more than any other puppy we’ve seen him interact with!